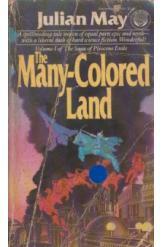 The Many Colored Land Julian May Sci Fi. Book is in good condition, all pages intact. Misfits, criminals, and adventurers of all stripes flee back in time to prehistoric Earth to escape the authoritarian Galactic Milieu. The first book of The Pliestocene Exile.